Vladimir Putin took part in the inauguration ceremony of Unit 1 of Kudankulam Nuclear Power Plant. The ceremony took place in videoconference format. 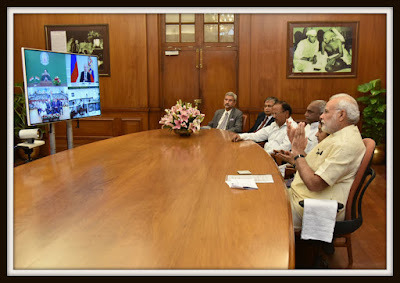 Taking part in the videoconference were Prime Minister of India Narendra Modi, Chief Minister of the State of Tamil Nadu Jayaraman Jayalalithaa, Chairman and Managing Director of the Nuclear Power Corporation of India Satish Kumar Sharma, and Head of the Atomstroiexport Group Valery Limarenko. Today, in accordance with the agreements we reached in Tashkent, we are witnessing the start of full operation of Kudankulam Nuclear Power Plant Unit 1 in India. This is a big event for our Indian partner, for the Russian company that carried out this project, and for all of us. The power plant was built using the most advanced world technology, Russian technology, and was built by Russian and Indian specialists working together. Cooperation in nuclear energy is an important part of the privileged strategic partnership between our countries. Our work together in this sector has great importance for our countries' development. This is not just about building a nuclear power plant and putting it into operation, but is a large-scale project to develop a new high-tech nuclear sector in India. This work involves transfer of skills and training of personnel and specialists in this area. Unit one is starting work at its nominal capacity and a second unit will also come on line in the not so distant future, and this will substantially boost India's energy supply and bolster its economic position. Peaceful nuclear energy development will be essential for a vast, powerful and rapidly growing country like India to resolve its social and economic tasks. Together with our Indian friends we have big plans in this sector. Work began on the power plant's third and fourth units in February this year. We plan to sign a general framework agreement and loan protocol for the construction of the third stage of the project by the end of this year. I would like to remind you that this project is being carried out using funds provided by the Russian Federation. Of the total project financing, 85 percent is in the form of a state loan provided by Russia. I congratulate everyone on today's event. I thank everyone who took part in implementing this project, and once again, I wish you success and all the very best. I am certain that our work together in this and other economic and high-tech cooperation areas will produce tangible and noticeable results and will contribute to our economies' rapid and effective development. Prime Minister of India Narendra Modi (retranslated): His Excellency President Vladimir Putin, Honourable Jayalalithaa ji, Chief Minister of Tamil Nadu, Sushma Swaraj, Minister of External Affairs, Minister Pon Radhakrishnan, my dear friends, welcome! Today is indeed a special day. 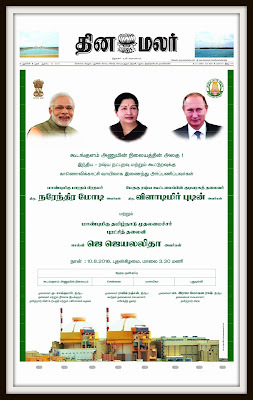 Today, Excellency Putin and I have the honour to dedicate Kudankulam Nuclear Power Plant Unit 1. I am particularly grateful to President Putin for his presence at this event. And I am delighted that Jayalalithaa ji, Chief Minister of Tamil Nadu, is also present with us on this occasion. 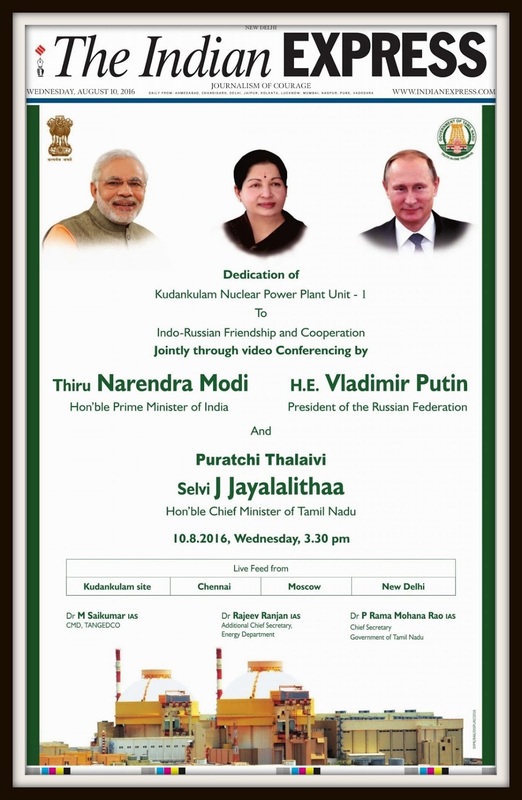 Friends,in dedicating Kudankulam 1, we mark another historic step in India-Russia relations. Its successful completion is not just another fine example of the strength of our special and privileged strategic partnership. It is also a celebration of our abiding friendship. And it is only a start of our collaboration in this field. Friends, today's event is also a joyful occasion for the team of Indian and Russian engineers, scientists and technicians. We salute their dedication and hard work and congratulate them for the fruits of their labour. Friends,the story of human development has been of wide spread technological advancement and growing economic prosperity. But, as we all know, it has not been without burden on our environment. I have a vision for India where achievements of our economic development are respectful to mother earth, and where the engines of our industrial growth are increasingly driven by clean energy. Kudankulam 1 is an important addition to India's continuing efforts to scale up production of clean energy in India. It also signals our joint commitment to build pathways of partnership for green growth. The people of India associate naturally and with great ease with the people of your great country. And personally, I have always deeply valued our friendship. It is, therefore, only fitting that today we join together to dedicate the Kudankulam Nuclear Power Plant unit one to the strength and vigour of our friendship and cooperation. I once again thank you, Excellency Putin, for joining me in this dedication and I look forward to meeting you at G20 in China. Also, my sincere thanks to Dr Jayalalithaa for being with us. Thank you. Thank you very much. Today is indeed a special day. 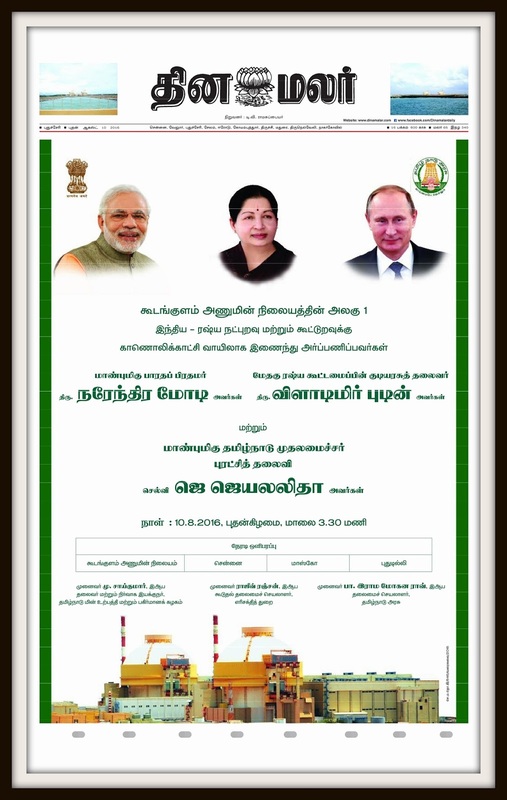 Today, Excellency Putin and I have the honour to dedicate Kudankulam nuclear power plant unit-1. 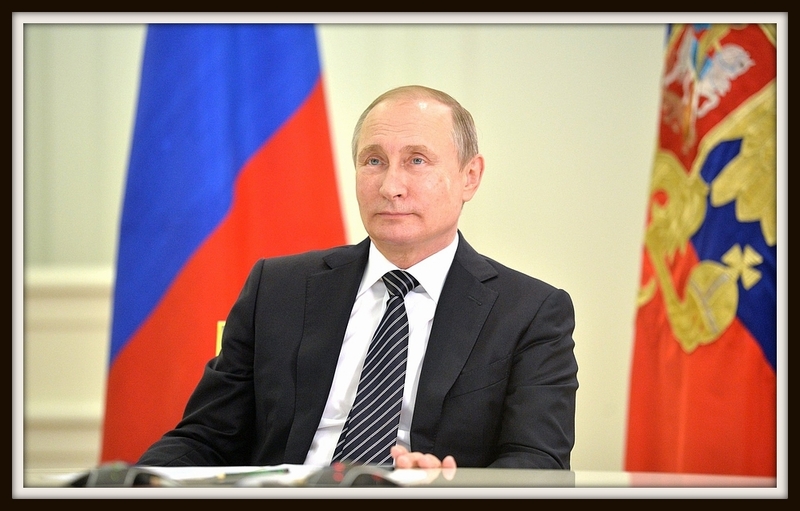 I am particularly grateful to President Putin for his presence at this event. And, I am delighted that Jayalalithaa ji, the Chief Minister of Tamil Nadu is also present with us on this occasion. 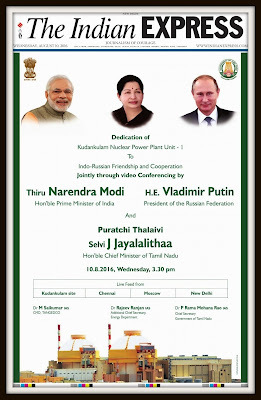 In dedicating Kudankulam 1, we mark another historic step in India-Russia relations. It is also a celebration of our abiding friendship. And, it is only a start of our collaboration in this field. It is perhaps not commonly known that at 1000 Mega Watt, Kudankulam 1 is the largest single unit of electrical power in India. In years ahead, we are determined to pursue an ambitious agenda of nuclear power generation. At Kudankulam alone, five more units of 1000 Mega Watt each are planned. In our journey of cooperation, we plan to build a series of bigger nuclear power units. Today's event is also a joyful occasion for the team of Indian and Russian engineers, scientists and technicians. We salute their dedication and hard work and congratulate them for the fruits of their labour. The story of human development has been of wide spread technological advancement and growing economic prosperity. But, as we all know, it has not been without burden on our environment. I have a vision for India where achievements of our economic development are respectful to mother earth. And, where the engines of our industrial growth are increasingly driven by clean energy. Kudankulam 1 is an important addition to India's continuing efforts to scale up production of clean energy in India. It also signals our joint commitment to build pathways of partnership for green growth. The success of our joint efforts in nuclear power generation is a proud achievement of our cooperation. It demonstrates our common resolve to keep our ties firm and steady. Above all, it showcases your personal commitment, consistent support and strong leadership in transforming the substance and character of our relationship. For this, I am grateful to you Mr. President. The people of India associate naturally and with great ease with the people of your great country. And, personally, I have always deeply valued our friendship. It is, therefore, only fitting that today we join together to dedicate the Kudankulam Nuclear Power Plant Unit-1 to the strength and vigour of our friendship and cooperation. 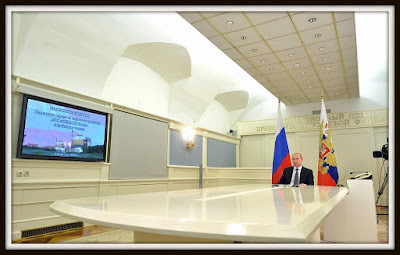 I once again thank you Excellency Putin for joining me in this dedication. Also, my sincere thanks to Jayalalithaa ji for being with us. 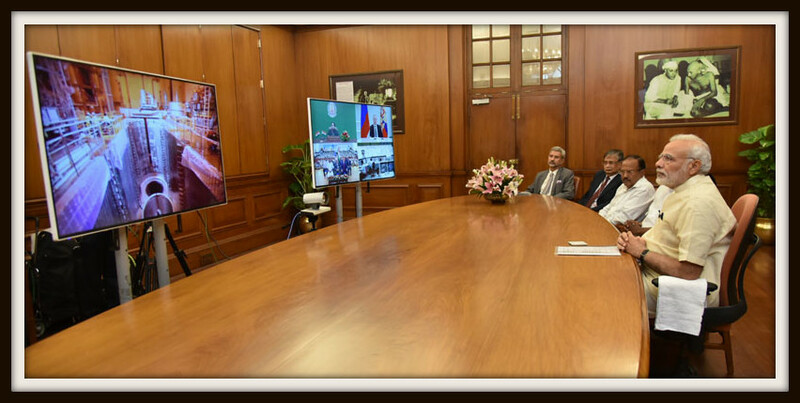 Your Excellency, President of the Russian Federation, Hon'ble Prime Minister of India, Chairman and Managing Director, Nuclear Power Corporation of India Limited, Mr. Limarenko, Head of "Atomstroyexport" Group of Companies! The Kudankulam Nuclear Power Plant is a monument commemorating the long-standing, abiding and deep friendship between Russia and India. Nuclear power is clean, green and firm power, which a rapidly growing State like Tamil Nadu, aspiring to even higher growth rates and shared prosperity, really needs. The dedication of the Kudankulam Nuclear Power Plant is a major milestone in Indo-Russian Friendship and Co-operation. Throughout my tenures in office as the Chief Minister of Tamil Nadu I have always extended support to the implementation of the Kudankulam Project while at the same time laying emphasis on allaying the fears of the local people by convincing them about the safety aspects of the plant. A Nuclear Power Plant takes longer to build and commission than conventional power plants. Not only is the engineering complex, very high safety standards need to be observed. 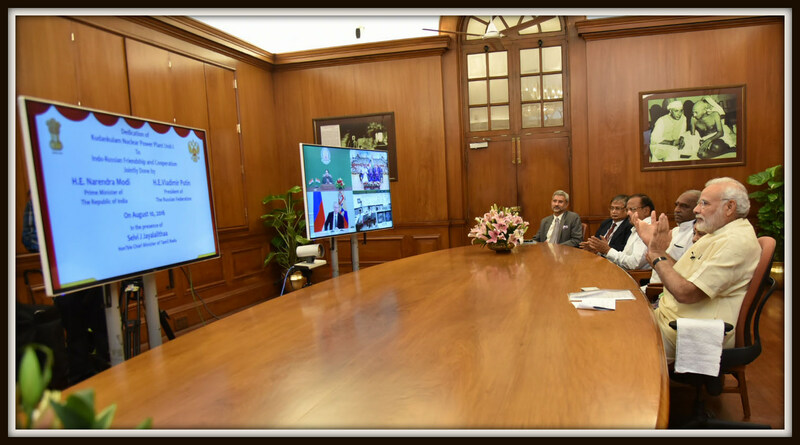 The smooth commercial operation of this Project overcoming many obstacles – economic, political and social; global, national and local – stands testimony to the unwavering commitment to the Project of the Governments of Tamil Nadu, India and Russia. The successful commissioning of the Kudankulam project is an object lesson on how the fears and apprehensions of the local population can and should be allayed, through a process of engagement and reassurance, and by building community assets and infrastructure. When the commissioning of the first Unit of the Project was getting delayed due to local agitation, I took up the matter with the Union Government to ensure that the fears and concerns of the people were heeded and addressed. To allay the fears of the citizens, an Expert Committee was formed by the State Government in February, 2012; The Committee heard the concerns of the people and reassured them on the safety features of the Project. Based on the report of the Expert Group, the Government of Tamil Nadu resolved to take steps, for the early commissioning of the Kudankulam Nuclear Power Plant and to allocate 500 crore rupees for the development of works in the areas neighbouring Kudankulam. Due to the confidence building measures undertaken by my Government Unit I of the Kudankulam Nuclear Power Plant has started commercial operation. I request that the second Unit may also be commissioned as early as possible considering the needs of our fast growing economy and the needs of our industrial and agricultural sectors. 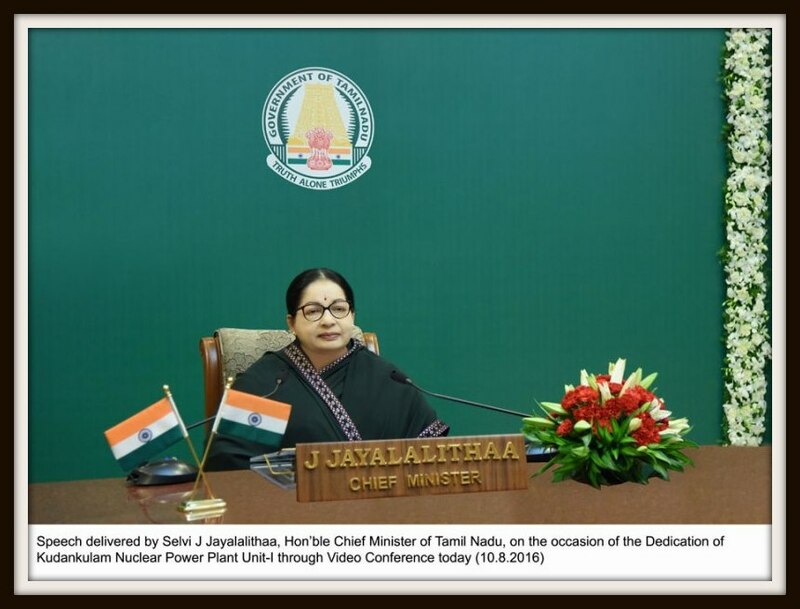 The Government of Tamil Nadu has played an important role in reassuring the local people of the high safety standards that would be maintained in the Kudankulam Nuclear Power Plant. I am confident that the Nuclear Power Corporation of India Limited will maintain the highest safety standards and also ensure continuous power generation at the two Units so that Tamil Nadu and the neighbouring States, can rely on Kudankulam as a reliable base load power station. I thank the President of the Russian Federation and the people of Russia for their contribution to the development of Tamil Nadu. 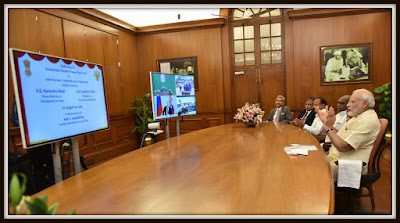 I also thank the Prime Minister of India for dedicating the Unit-I of the Kudankulam Power Plant jointly with the President of the Russian Federation. I also request that the commissioning of the second unit may be expedited.